We have had so many bird babies fluttering about in the past two weeks, it's amazing! I am so excited to see every year get better and better on what can be birthed in a backyard wildlife habitat where you garden for the benefit of wildlife. In the order that the new birds have appeared, we've had Carolina Wrens, Black-capped Chickadees, Gray Catbirds, Eastern Bluebirds, Blue Jays, Cardinals, House Finches and Red-shouldered Hawks. 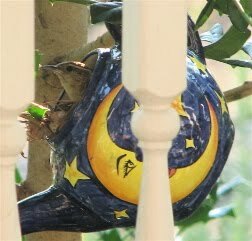 We also have a wren's nest in the teapot hanging by the front porch. Here's a video of a parent wren feeding the fledgling on our deck. We put dried mealworms in the pots to help those ferocious appetites (only do this if you don't use chemical fertilizers). I absolutely love this time of year here in Central Virginia. Cool mornings and all the free entertainment ... well, there is the cost of the food, but that's less than what we'd be paying for DVD rentals, movie tickets, cable television, etc. Nothing can beat it for me and my honey of a husband. It's grand to find joy in the little things.